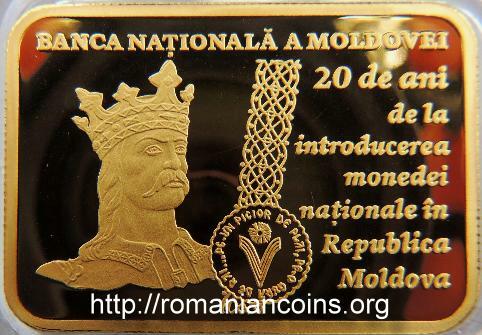 REPUBLICA MOLDOVA meaning "REPUBLIC OF MOLDAVIA", year 2013, cipher BNM of the National Bank of Moldavia, coat of arms of the Republic of Moldavia, denomination "100 LEI", an adorning motif effigy of Stephen the Great and the Holy, folk's adornment inside which "PE-UN PICIOR DE PLAI, PE-O GURĂ DE RAI..." is written, inscription "BANCA NAŢIONALĂ A MOLDOVEI 20 de ani de la introducerea monedei naţionale în Republica Moldova", meaning "NATIONAL BANK OF MOLDAVIA, 20 years since the introduction of national currency in the Republic of Moldavia"
REPUBLICA MOLDOVA meaning "REPUBLIC OF MOLDAVIA", year 2013, cipher BNM of the National Bank of Moldavia, coat of arms of the Republic of Moldavia, denomination "200 LEI", an adorning motif effigy of Stephen the Great and the Holy, folk's adornment inside which "PE-UN PICIOR DE PLAI, PE-O GURĂ DE RAI..." is written, inscription "BANCA NAŢIONALĂ A MOLDOVEI 20 de ani de la introducerea monedei naţionale în Republica Moldova", meaning "NATIONAL BANK OF MOLDAVIA, 20 years since the introduction of national currency in the Republic of Moldavia"
The coin belongs to Historical events series. 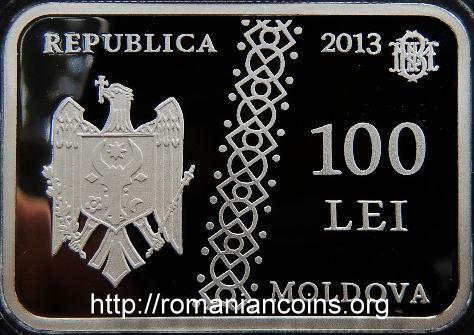 The motif on the obverse is almost identical to the ornament appearing on the banknotes of 200, 500 and 1000 lei issued by the Republic of Moldova. 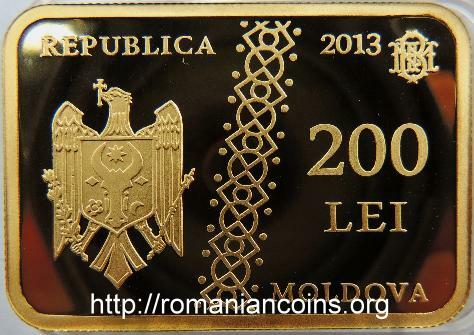 The motif on the reverse is almost identical to the ornament appearing on the banknotes of 1 leu, 5 and 10 lei issued by the Republic of Moldova, existing in circulation in 2013. The wavy circle with inscription "PE-UN PICIOR DE PLAI, PE-O GURĂ DE RAI..." appears on all Moldavian banknotes in the current series. The "V"-shaped ornament composed out of four lines stands for a symbol of Victory. Above it lies the symbol on the Sun on the vault of heaven. The image of Stephen the Great is a partial reproduction of the statue in Chişinău, work of sculptor Alexandru Plămădeală, the detail and perspective being carried over from the circulation banknotes. On the 29th of November 1993 the 1 ban, 5 bani, 25 bani and 50 bani 1993 aluminum coins as well as the 1 leu 1992 and 5 lei 1993 iron-nickel coins have entered circulation (years explicitly present on the coin as striking years). The value of 10 bani was added to the series in April 1996. These coins were manufactured by the State Mint of Romania, bearing initials C.D. of engraver Constantin Dumitrescu. After some years the initials were discontinued on the newer coins, the pieces not featuring C.D. being apparently struck in the Republic of Moldova. A new variant of 50 bani entered circulation on the 2nd of February 1998. These coins were manufactured in the Czech Republic. The old aluminum coin of 50 bani was maintained into circulation over to the 31st of December 1998 only. The 1 leu 1992 and 5 lei 1993 coins were withdrawn from circulation after a few years. According to the word of mouth this was because the design of these coins was too simple and therefore they were to easy to be falsified. The Moldavian banknotes were designed by artist Gheorghe Vrabie. His signature however only appears on the 100 lei banknotes, at the right side of the image with the Fortress of Tighina. All Moldavian banknotes carry the year of printing which is not necessarilly the year of entering circulation. The first banknotes which entered circulation were the ones of 1 leu 1992 and 10 lei 1992 (type I) and 20 lei 1992 (type II), in November 1993. The banknotes of 1 leu and 10 lei type I, as well as 5 lei type I, did not feature any safety elements. They only featured a watermark, so they were replaced after 1994 with new banknotes type II. In 1994 only type II banknotes entered circulation: 1 leu 1994 and 5 lei 1994, 10 lei 1994 and 50 lei 1992. The following type II values entered circulation as follows: 100 lei 1992 and 200 lei 1992 in 1995, 500 lei 1992 in 1999, and the highest value - 1000 lei 1992 - entered circulation in 2003 . The themes on the actual banknotes are the fortresses and monasteries of Moldavia, lying within the current borders of the Republic of Moldova and a few buildings in Chişinău. As it can be noted, there is a whole line of banknotes printed in 1992, starting from 1 leu and ending up at 1000 lei. Although all these were printed (type I, at the Printing House of the National Bank of Romania , type II - probably in France) in 1992, they entered circulation step by step, starting in 1993 over to 2003. After the national currency was introduced, all still circulating Soviet roubles were withdrawn (over to December 2nd 1993), as well as all Moldavian coupons, 5 lei 1992 type I inclusively . 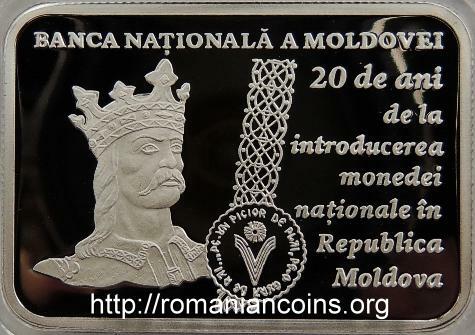 On the 27th of August 1991 Republic of Moldova proclaimed independece. Of course, immediately after this event, Soviet roubles were still in use. The National Bank, founded on June 4th 1991, was itself operating with Soviet rouble. The inflation in the ex-Soviet space and the introduction of the Russian rouble in the Russian Federation were able to drive a massive migration of Soviet debased currency toward the Republic. In order to prevent the invasion of roubles, the National Bank of Moldova (BNM) has introduced to circulation own coupons (June 10th 1992). The Moldavian coupon was equal to the Soviet rouble. Coupons of 50, 200 and 1000 have circulated. The coupon of 5000 was introduced to circulation on September 8th 1993 . New coupons have entered circulation on September 20th the same year, with nominal inscribed value of 5 lei and dated 1992. 1 leu was worth 1000 roubles. Although these bills have been used as coupons, they look like banknotes, as they were manufactured based on the first Moldaviant projects for banknotes designed by artist Gheorghe Vrabie (type I). The 1 leu and 10 lei bills, also type I, have entered circulation on November 29th 1993, as banknotes. After the introduction of national currency, the coupons and the roubles were exchanged at the rate of 1 leu (new) = 1000 coupons = 1000 roubles . The withdrawal of old roubles had started as soon as July 1993, when the circulation of 200, 500 and 1000 roubles notes had been stopped. In the banknote catalogs for the Republic of Moldova so-called Consumer's carnets are listed, each containing 28 coupon cards of various values in roubles, printed in a single sheet (carnet), cards that could be individually cut out of the carnet. The employees were receiving such coupons in amount of 70% of the salary (with the following exception: 75 coupons for salaries below 100 roubles). Example: for a salary of 200 roubles, an employee would have received 200 roubles and 140 coupons. A fair share of the necessity goods could not be bought other way than with money and same sum in coupons . 1. Boldureanu Ana, Moneda naţională a Republicii Moldova. în Conspecte numismatice (III), Chişinău, 2013, p. 37 ... 44. 2. ***, Moneda naţională: o istorie de succes? Centrul de Investigaţii Strategice şi Reforme - Economic Survey Moldova în tranziţie nr. 2. 1998, accesat în ianuarie 2014. 3. ***, Moneda naţională. Banca Naţională a Moldovei, accesat în ianuarie 2014.